Land the surface assault element of the landing force and their equipment in a single lift from assault shipping during amphibious operations to inland objectives; to conduct mechanized operations and related combat support in subsequent operations ashore. The Battalion organization was activated on March 18, 1942 at Marine Barracks San Diego, California. The "Second Amphibian Tractor Battalion" was an Organic unit of the 2nd Marine Division, composed of a Headquarters and Service Company and three letter companies, all equipped with the Landing Vehicle Tracked-1 (LVT-1). 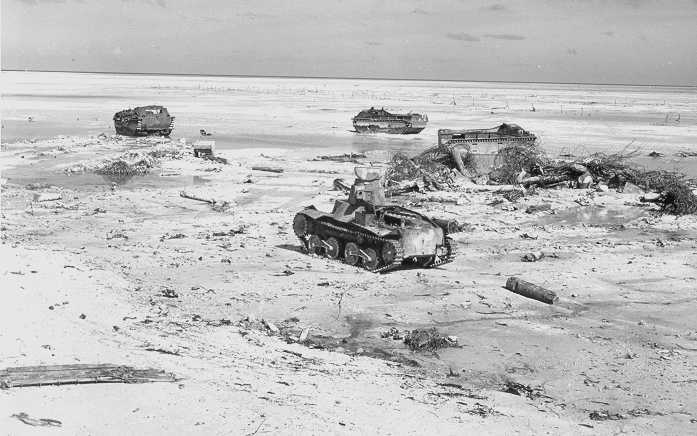 Disabled U.S. LVTs and a Japanese Type 95 light tank on Tarawa litter the beach after the battle. In 1942, the Battalion set sail from San Diego, CA with the 1st Marine Division to meet the Japanese tide sweeping across the South Pacific. Elements of the 2nd Amphibian Tractor Battalion participated in assaults on Guadalcanal, Tarawa, Saipan, Tinian and Okinawa. After the surrender of Japan in August 1945, the battalion returned to the United States and deactivated on 29 November 1945. The 2nd Amphibian Tractor Battalion was reactivated on 1 May 1946. The Battalion was stationed at Camp Lejeune, North Carolina where it participated in peace time training with the 2nd Marine Division. During this time the Battalion was equipped with the LVT-3 and consisted of a Headquarters and Service company and four letter companies. As a result of the economy program, the Battalion was once again deactivated on 16 October 1949. In 1966, the battalion transferred 260 Amphibian Tractor Crew men to Vietnam. Throughout the war, the 2nd Amphibian Tractor Battalion supported routine deployments and provided training support to the 2nd Marine Division. AAV's at the port of Cape Haitian, Haiti 1994. Elements of deployed in support of Multinational Force Beirut Lebanon 1983-1985 as part of the 24th Marine Amphibious Unit (MAU). Elements of the battalion participated in Operation Urgent Fury in Grenada in 1983 as part of the 22nd Marine Amphibious Unit (MAU). Deployment to the Persian Gulf as part of Operation Desert Shield and Operation Desert Storm. Deployment to Somalia in support of protecting the delivery of food in Dec. 1992, and in May 1993 the UN took control of the relief efforts from the U.S. In August 1994, a platoon from Bravo Company 2nd AABN and Golf Company, 2nd Battalion, 2nd Marines departed for the Caribbean and Haitian waters for Operation Support Democracy. On the morning of September 20, Marines once again landed on the shores of Cap Haitian, Haiti since the first landing by Major Smedley Butler in 1915. Tensions were high and a fire fight ensued between Haitian military police and a Marine patrol. The incident ended with no Marine deaths but Ten Haitian Policeman were killed. Battalion 2/2 and its AAV attachment remained during Operation Uphold Democracy lasting until October 1994. In April 1996, Golf Company 2/2 and Charlie Company 1st Platoon was attached to the 22nd Marine Expeditionary Unit. The AAV platoon was used as rifleman and as a reactionary force in support of Golf Company during the reinforcement of the American Embassy in Monrovia, Liberia during Operation Assured Response. An AAV from 2nd AABn conducts an IED sweep outside of Fallujah in August 2006. The battalion was deployed to the Middle East in 2003 and took part in Operation Iraqi Freedom I providing mechanized support for the infantry regiments. On 23 March, elements of Company A and C fought in the Battle of Nasiriyah with Regimental Combat Team 2. After the invasion, the battalion began a regular rotation of companies to Iraq. Usually designated "Team Gator", these companies provided both traditional AAV missions and provisional infantry missions. Company C and D participated in the Operation Phantom Fury (Second Battle of Fallujah) in November 2004 - January 2005. In 2007, Company D was the last 2d AABn unit to use AAVs in country. They switched, in January 2008, to MRAPs and continued security missions all along Mobile, their usual area of operations (AO), after Operation Phantom Fury. Company B deployed to Ramadi in support of 1st Battalion, 9th Marines. The company was tasked with operating the numerous entry control points (ECPs) around the city. Company A deployed as MRAP Company and relieved Company B and took over the ECP's in Oct 2008 in Ramadi. They then closed all ECP's down and turned them over to the Iraqi Police in Feb 2009 and returned home. Amphibious Assault Vehicles from 2nd Assault Amphibian Battalion splash off the back of an amphibious assault ship off the coast of Camp Lejeune, NC in 2009. Elements of Company C deployed to the Helmand Province with Battalion Landing Team 1/6 as part of the 24th Marine Expeditionary Unit. The platoon was part of combat operations in the Taliban filled district of Garmsir. Company D deployed to the Helmand Province, Afghanistan as MRAP Company, Regimental Combat Team 3 in 2009. They conducted route security missions, local population engagements, screening missions, and manned two combat outposts while attached to 1st Battalion, 5th Marines. Company B, Det-A deployed from November 2009 to May 2010 to relieve Company D as MRAP Company for Regimental Combat Team 7. Fourth Platoon was attached to 1st Battalion, 3d Marines and conducted provisional infantry missions from two combat outposts. Third Platoon and the company headquarters element participated in Operation Moshtarak (Battle of Marjeh). After supporting clearing operations with the 3/4/205 Afghan National Army battalion, the platoon provided security at the Marjeh Government Center and for the District Governor. Company B, Det-B deployed as part of the troop surge in Afghanistan in December 2009. They were designated as the Base Defense Operations Center company and secured the major southern Helmand Province Marine base Camp Dwyer. Second Platoon provided the guard force for the base and manned a nearby outpost. Elements of 1st Platoon also participated in route security and screening missions during the preparations phase of Operation Moshtarak. Marines from Bravo Company, 2nd Assault Amphibian Battalion return fire on the Taliban during Operation Moshtarak in Marjeh, Afghanistan 2010. Justin LeHew - One of the most highly decorated US Servicemen serving in the war on terror. Recipient of the Navy Cross for action during the Battle of Nasiriyah in 2003. Recipient of the Bronze Star Medal with combat "V" for heroic actions during the battle of Najaf 2004. Luis E. Fonseca, Jr. - recipient of the Navy Cross for action during the Battle of Nasiriyah in 2003.